Date: August 24 – 27, 2017. We will be going on to the Castle Esplanade as a group then moving to our own seats for the event. To make a good show all members in the group should wear as much Elliot tartan as possible. 150 tickets will be available in the arena for our Clan Members to book. Seats can be booked from 21st November 2016 but no later than 1st March 2017. Tickets go on sale to general public 1st December, 2016. No more than eight tickets can be bought by any one Clan Member. A password has been allocated to our Clan must be used when booking seats. For those of you who are interested in attending send an email to elliotgathering@btinternet.com and you will be provided with the designated password to enable you to book your seats wherever you choose in the arena. Also provide the names of all Clan members who wish to travel by coach from Newcastleton. Please look on Edintattoo.co.uk for the seating plan and costs of the seats in the various areas. The Holm Show and the Elliot Clan Society are hosting this event to take place on the Holm Show field, Newcastleton. SCOCHA are an extremely popular and lively Hawick folk ‘n rock band. This will kick off the Gathering with a bang! Shuttle bus operating from Douglas Square, Newcastleton all day. No parking up at the house apart from disabled. Demonstration of dry stone wall and stick making. We blast off with the cannon! By invitation only for officials of the International Clan Society. Suggest a visit to Hermitage Castle and the Heritage Centre in Newcastleton. Small entry fee at the gate. This is a perfect example of an old established local agricultural show with animals, sports, terrier racing, Cumberland wrestling, crafts and competitions. “An Evening of Debatable Crack” event at Kirkandrews on Esk (10 miles away). Admission by donation. 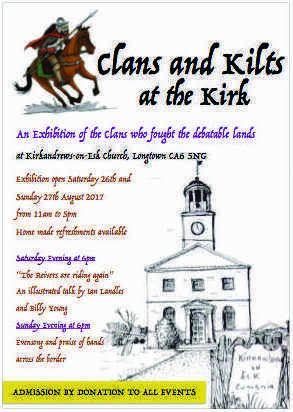 “Clans and Kilts at the Kirk” a weekend exhibition of the Clans who fought in the Debateable Lands open 11 am to 5 pm. A beautiful location on the banks of the River Esk. Home baking and soft drinks, tea & coffee. There have been about 250 people at past gatherings. Photographs are permitted at Hermitage Castle and also in the Clan room. Weather in Scotland is never predictable! It may be warm and sunny; it may be cold and wet. Wet-weather gear is essential in Scotland at all times of the year, especially in the footwear department. Wear as much Elliot tartan as you can muster! Newcastle Airport — 1 1/2 hours away. Glasgow — two hours away. Edinburgh — two hours away. To get to Redheugh, you will have to hire a car. Google map and directions from Edinburgh airport to Redhuegh. Newcastleton is a rural community with bad public transport and you will need a car. You will not, however, be able to park your car at Redheugh on the day of the Gathering as there will be a shuttle bus operating from Douglas Square, Newcastleton (approx. 2m away) all day. There are many hotels and B&Bs nearby. If you would like help with accommodation please contact us and we will try to find you a location. Special parking passes available on request. NOTE: You must be a member in good standing of the Elliot Clan Society to request tickets. We will acknowledge receipt of your order as soon as possible. Tickets for the Sunday coach trip will be sold on a first come, first served basis as we have to limit numbers.